When you spend years on the road, you either learn to adapt or it breaks you. Simple as that. 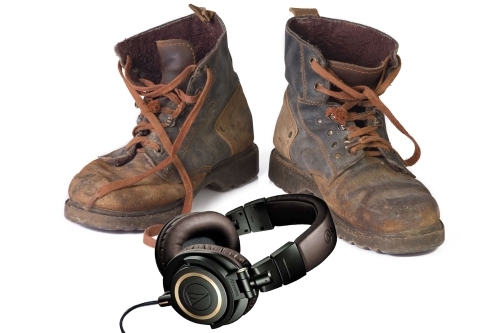 Rule number 7 -- Never go cheap on headphones or work shoes. 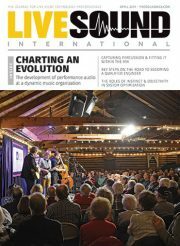 Traveling audio production professionals, often known as road dogs, can be on the road for years at a time. My time out there kept me away from home enough to learn a few good tricks. In my experience, you either learn to adapt to the lifestyle or it breaks you. Simple as that. Here are the big rules that helped me keep my sanity out there. Audio gear invariably intermingles with band gear. It’s important to be able to identify what’s yours, unless you really like buying new stuff each week. Each piece needs a consistent identifier that’s visible at a distance, even that $100 microphone and $50 cable are worth a minute to tag. Most crews have something unique – I’ve seen everything from spray paint stencils to barcodes. Even a strategic dot of paint can help you separate what’s yours and what’s not at loadout. Years of pain can come from a moment of stupid. Even if you’re big enough to manhandle a double-18 sub, I suggest that you don’t. It’s not worth it. Give the manufacturers a little credit for accurate specs. If a box says “2-person lift” then get help with it. Don’t learn this one the hard way. Manage your own money and be responsible with your clients’ money. Learn to play defense with cash, and know that some seasons you’ll be rolling and others you’re checking for holes in your pocket. Read about the parts you haven’t mastered. Plan accordingly. In the end, it’s not about what you make, it’s about what you keep. This is invariably worth more than mix skills. The ability to communicate respectfully and intelligently is always an asset. Be nice, and assume the best of everyone, at least until those options run out. Honor your word. Negotiate fairly. A good deal is a good deal for everyone. Try the local stuff. Skip the drive-thru, get coffee anywhere but the usual spots, think “I’ve already had that, let’s try something new.” To this day, the best meal I ever had was a block from a convention center after telling a waiter to bring me whatever the chef was most proud of. And of course, it was something I never would have ordered. Boom. My world expanded. Check out the local attractions whenever possible. Visit the local museums, catch a show, take a walk through a park. Send pictures to your family. Kids love souvenirs. “Work hard, play hard” might be the best advice I ever received. Both can cause or help eliminate pain, and your ears and spine will thank you. Good headphones will be accurate, loud enough for the work environment, and comfortable. Enough said. With this caveat: particularly if you load a lot of gear, go for the steel-toe option with shoes. Without exaggeration, I can honestly say that cable issues account for around 90 percent of system malfunctions. Take care of them and most of your problems go away. Carry basic tools like a cable tester, wire strippers, and (preferably) a dual wattage soldering iron, and learn to use them the right way. It’s not rocket science. Paper trails are often as good as an actual contract. You wouldn’t believe how many times someone attempted to manipulate the terms of our agreements in the beginning, so it kept everyone straight. Cheapskates and chiselers are all too common production. Forwarding someone their own email usually resolves those problems. Reach outside your comfort zone, go out of your way for someone. That random tool someone dropped? Pick it up and return it. The festival techs that haven’t had a break for six hours – find out what they need. Plus there can be added benefits; the next time they’re asked for a recommendation, you just might be at the top of the list. Always drink upstream from the horses. Don’t stand up in a canoe. Tip your waitress. Skip the midnight burritos. Always pack snacks and water for the gig. Be teachable. Be professional.